My little sister graduated high school this past weekend, and it made me feel old. I am so excited for her, but I really wish she would turn 21 already so we could actually celebrate something! I racked my brain on what to get her for a present, remembering what I wanted for graduation, money! I wanted to give her something more personal, I’m sure she would have liked money, but to bad this isn’t about her, OK maybe it’s supposed to be, but oh well, I am making her present’s, because that means it comes from the heart!! Apparently arrows are trending, so she loves them! 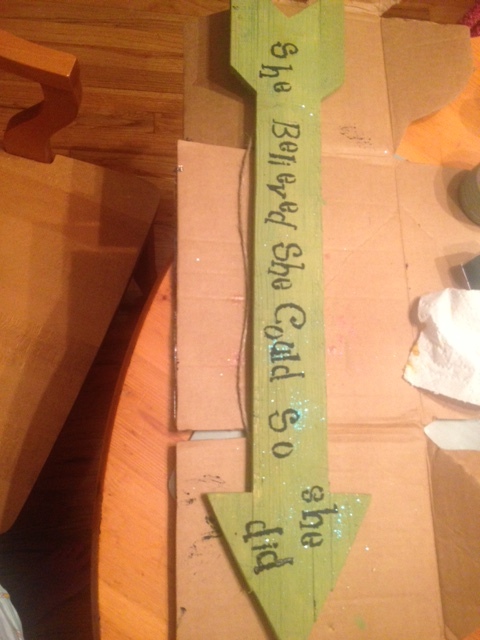 I decided to make her a shirt to wear at her graduation party and an arrow with an emotional quote on it. We will start with the shirt, I found a white racer back at Marshals for $3.99, I would say it was a bargain, and they are in style as well, as my youngin counter parts keep me informed. 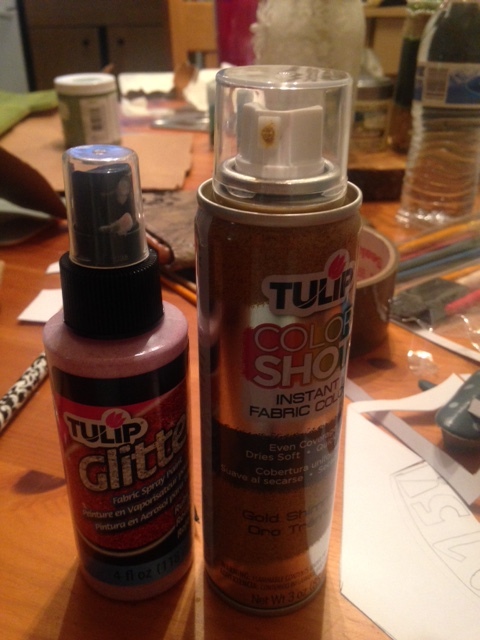 I then set out to Michael’s and got fabric spray paint, gold and glitter the Tulip brand, and went to work. I couldn’t find exactly what I wanted for an iron on or stencil so I made it myself. I wanted her initials in the circle monogram with a graduation cap on top. Remember when we burnt cd’s all the time? 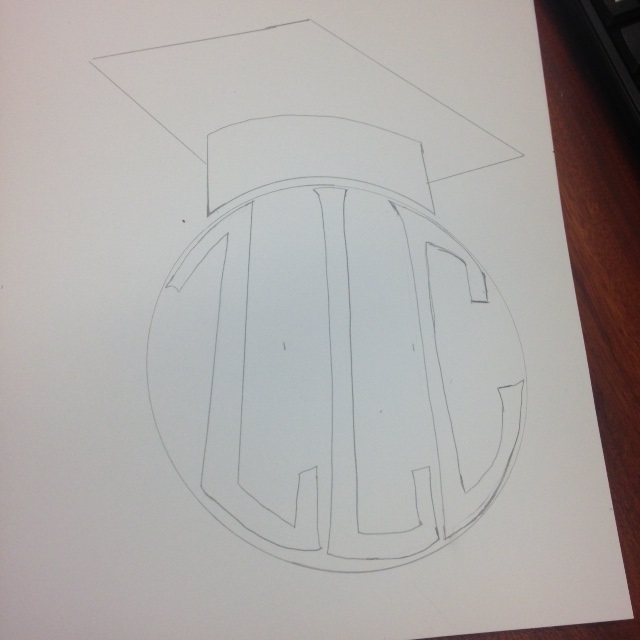 I used the bottom of one of the holders for a circle and drew the letters inside, with the circle as my guide, using a ruler I drew the graduation cap. 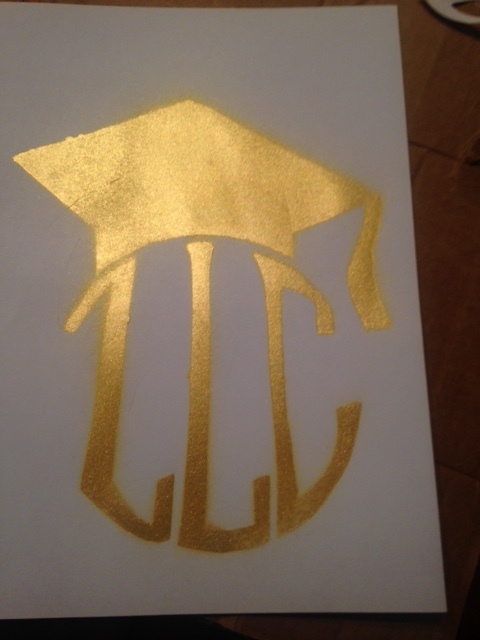 I used card stock to make it a little thicker and exacto knifed out the letters and cap to make my own stencil, tested it on some card board and it was perfect! 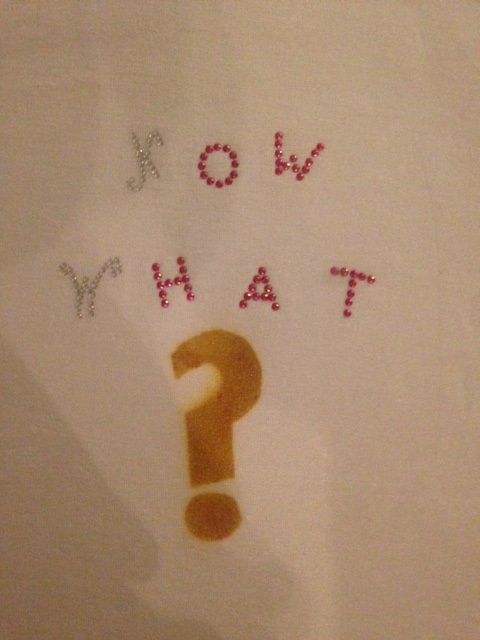 On the back of the shirt I used some left over iron on letters to write out “Now What” and sprayed on a question mark, I think I am very clever, witty and hilarious. I let that dry on the ironing board over night, bad idea. I must have left the iron on it to long since the glue seeped through the shirt and basically glued the shirt to the ironing board, so I had to rip it off and redo the letters, so put it on a hanger to dry, lesson number one learned. 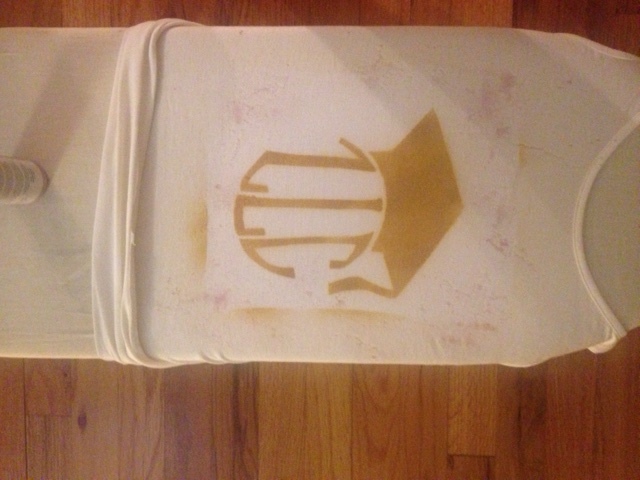 Once that was all dried I moved on to spray painting the stencil on to the shirt. 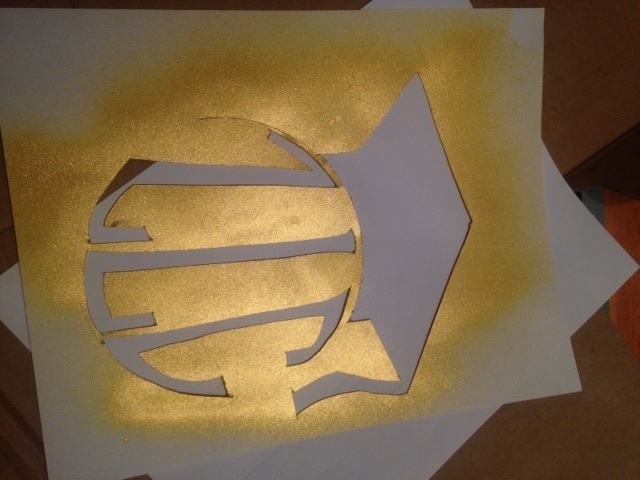 I loved the gold spray and how it was coming out, I tapped the stencil on and sprayed away! Lesson two learned, either relax on the spraying or cover any part of the shirt you don’t want paint on. I got paint all over the edges, I thought I would spray the glitter on it and try to make it look on purpose, it might have worked if the glitter spray didn’t come out in clumps, I recommend the gold spray but not the glitter. I showed husband, he had some suggestions I ignored and I just let it dry to move on to the arrow. 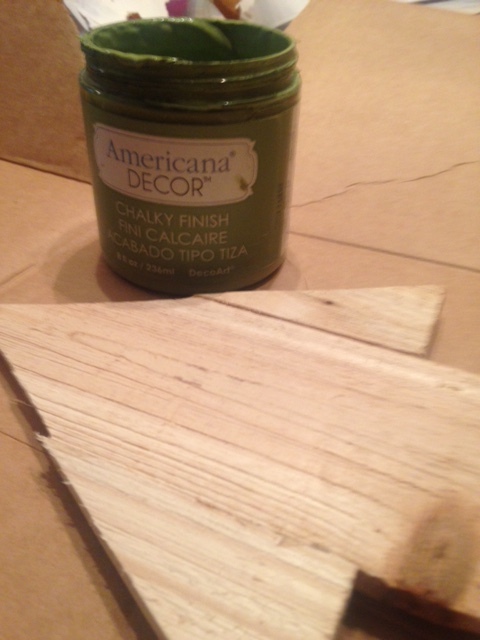 The arrow I also got from Michael’s along with the Americana Decor chalky paint and stencils. I covered the arrow with the chalky paint and let it dry, because I couldn’t help myself I threw some fine glitter on it as it dried. The next day I decided on the quote, “She Believed She Could So She Did”, I thought it was fitting for graduation. Using black paint I set out to stencil the words, the key to stenciling, I think, is patience. I have none. So I rushed through it, I did the first letter and had my husband hold up the edges so I could do the next without smudging it, except he kept dropping it and we smeared some letters. I’m pretty sure you are supposed to let it dry first. We finished the words, they came out pretty decent and I let it dry. 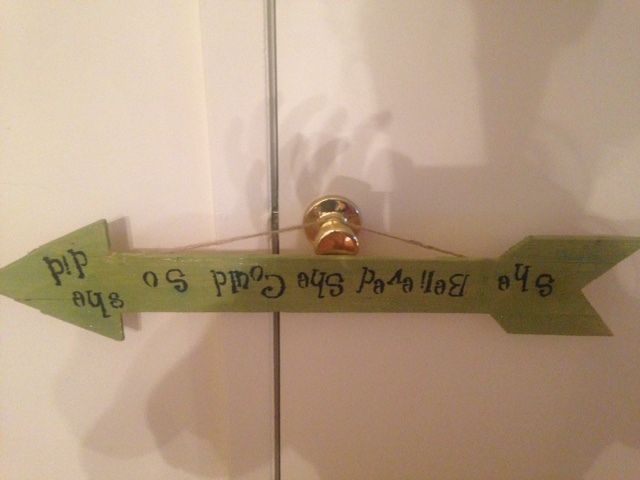 I held it up because I was happy to see the finished product and realized then I did it upside down. Oh well she got it anyway!!! Now you may think I copped out on her present, but I thought DIY would mean it came from the heart. I think she pretended to like them, which works for me, but I am also taking her for a graduation adventure day which is forth-coming. And no… she didn’t wear the shirt to her party.